The lifetime of element 117, which has now been created in the lab for the first time, confirms that superheavy elements lie in an island of stability on the periodic table. The lifetime of element 117 bolsters confidence in theories that predict that superheavy elements occupy an “island of stability” in a chart of elements and their isotopes. The island is indicated by the red region at the upper right. Atoms in the stable region decay much more slowly than atoms with characteristics that place them nearby, but outside, the region. A collaboration of Russian and US physicists has finally created element 117 – a superheavy element made of atoms containing 117 protons that is roughly 40% heavier than lead. The achievement fills in the final gap on the list of observed elements up to element 118. The team produced the elusive element 117 by fusing together atoms of calcium and another rare, heavy element known as berkelium. The research will appear in a forthcoming issue of the journal Physical Review Letters and will be the focus of a Viewpoint article by Sigurd Hofmann (Helmholtz Centre for Heavy Ion Research) to appear in APS Physics. Like all superheavy atoms, element 117 is unstable, lasting only fractions of a second before self-destructing in a cascade of lighter elements and particles. After smashing calcium atoms into a target of berkelium in a particle accelerator at the Joint Institute for Nuclear Research in Dubna, Russia, the team deduced the fleeting existence of element 117 by studying the daughter particles emitted as the atom decayed. Despite the atom’s short lifetime, element 117 lives longer than many lighter elements. The discovery confirms theories that predict that 117 and its recently-synthesized cousins, elements 116 and 118, exist in an island of stability on the periodic table. Only synthesizing increasingly heavy elements will show just how far the stable region extends up the list of elements. 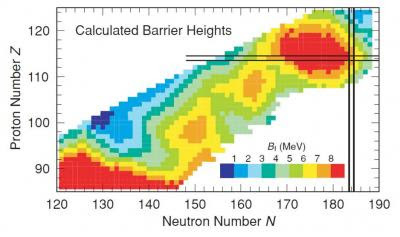 While there is no known practical application for such short-lived atoms, the synthesis of superheavy elements is vital for testing models that explain how the neutrons and protons that make up all the elements bind together. Such models in turn help explain the relative proportion of more common elements in the universe, as well as offering predictions of other exotic atoms that may be stable enough occur naturally on Earth or in meteorites.